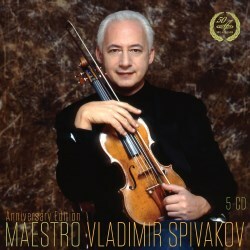 This very welcome 5 CD set has been released to celebrate the seventieth birthday of the Soviet musician Vladimir Spivakov (b. 1944). An all-round musician, he has forged a five-pronged career encompassing that of violinist, conductor, jury member, concertmaster, teacher and educator. He organizes annual music festivals, founded the Chamber orchestra Moscow Virtuosi, which is featured in the compilation, and has always striven to make music more accessible to those less fortunate. As a violinist, he studied at the Moscow Conservatoire, where he was mentored by David Oistrakh, no less. As a budding conductor, both Lorin Maazel and Leonard Bernstein featured prominently in his development. It is also interesting to discover that poetry and painting feature in his life. I can’t think of anyone more deserving of an anniversary tribute. CD 1 contains previously unreleased concert recordings from the Fourth International Tchaikovsky Competition in 1970. Spivakov came away with second prize and a silver medal for his performances of the Tchaikovsky and Sibelius violin concertos as well as captivating accounts of the Tchaikovsky, Sarasate and Shchedrin pieces accompanied by Maria Gusak. The Tchaikovsky Concerto is both exciting and beguiling, and certainly doesn’t pander to over-emotionalism. There’s a lusty and exuberant current running through the first movement and the violinist meets all the technical challenges head-on. He achieves a beautifully controlled pianissimo in the Canzonetta, and doesn’t linger too much - unlike some. The finale showcases some crisply incisive spiccato, and the work ends in a blaze of glory. Yuri Temirkanov proves a sympathetic partner. The Sibelius Concerto is a spacious account, deeply evocative, conjuring up images of the vast, rugged Finnish wilderness. Spivakov’s technical command is praiseworthy, yet he imbues the music with eloquent lyricism when called for. He brings poetry and yearning to the slow movement, yet the finale would have benefited from a little more fire and passion. Audience presence in both concertos is faintly discernible but not intrusive in any way. Applause is retained. There’s a violin and piano recital, again from 1970, where the violinist is accompanied by Viktoria Postnikova. The Locatelli Sonata which opens the programme is a work unfamiliar to me. It is intoxicatingly played, and both players lavish upon it refinement, elegance and charm. Paganini’s Le Streghe, with its pure harmonics and sparkling left-hand pizzicatos, easily stands comparison with those of Ruggiero Ricci. The Franck Sonata must be one of the most compelling I’ve heard, and Postnikova’s sensitivity adds to the success of the mix. It is unhurried, with both players basking in the score's melodic richness. The Bartók and Prokofiev works are heard in idiomatic and deeply probing readings. Spivakov’s collaborations with the pianist Boris Bekhterev are represented with recitals from 1972 and 1981. This partnership is not as successful as that between the violinist and Viktoria Postnikova. Whilst Bekhterev’s contributions are serviceable, I find Postnikova’s pianism and artistry more alluring, sensitive and sympathetic. The Schubert Sonatina Op 137/2 which comes at the beginning of CD 5 highlights one problem I have with Spivakov’s playing. Whilst his formidable and intelligent musicianship cannot be called into question, and he is technically well-groomed, his fast, insistent vibrato, relentless at times, severely limits his tonal palette. This renders some, but not all, of his playing rather one-dimensional and monochrome. The Schubert Sonatina is one victim of this ‘one size fits all’ vibrato and, as a performance, doesn’t really work for me. The Bartók, Bloch and Saint-Saëns selections fare much better. The only other disappointment is the Wieniawski Polonaise which is over-cautious and rather po-faced, lacking Heifetz’s risk-taking and wow factor. It was in 1979 that Spivakov, together with a group of friends and associates, founded the Chamber orchestra Moscow Virtuosi, mustering some of the finest musical talents around at the time. It took four years, until 1983, to prove its worth and gain official status, entitling it to governmental financial support. Vladimir Spivakov became its artistic director, and it soon amassed a wide-ranging repertoire from Bach to Schnittke. Discs 2 and 3 feature the orchestra in works by Rodion Shchedrin and Mozart. Shchedrin’s Music for the Town of Köthen was written especially for Spivakov. It is an attractive three movement work. The first is spiky and angular, with an underlying sombre complexion. The composer gives plenty of scope for the individual woodwind players to shine. A melancholic Andante follows, ardently realised by the strings. A bustling finale ends the work with gusto. The performance is well-rehearsed and precision of ensemble is remarkable. Shchedrin is better known for his ballet suite Carmen, after Bizet. That work demonstrates the composer’s imagination and compositional skill. All the well-known tunes are there. The ballet is a masterstroke of scoring, and the Moscow players do it proud; one senses real joy in the music-making. Mozart’s Symphony No. 28 isn’t that well-known, so it’s a treat to have it included here. Nicely paced, the Moscow soloists make the sun come out in the opening movement. Spivakov is a charismatic conductor inspiring the orchestra to deliver a performance of spontaneity and freshness. The Andante is deliciously contoured and the Presto finale sparkles with vitality and verve. The Coronation Mass, taped in 1986, is a reverential and stylish account that exudes joy and confidence. It’s obvious that Spivakov relishes the music’s lyricism. The soloists, none of whom I’ve heard of before, are excellent in every way and blend well. The choir sound well prepared, with diction clear and cleanly articulated. Audio quality throughout is exceptionally fine, with the Moscow Virtuosi orchestral selections outstanding. Comprehensive liner-notes in Russian, English and French are up to the mark. This is a worthy anniversary tribute to a multi-faceted musician.